Do you have a group of friends that would like to get together and take classes of your choice? Contact us - we can arrange that for you. 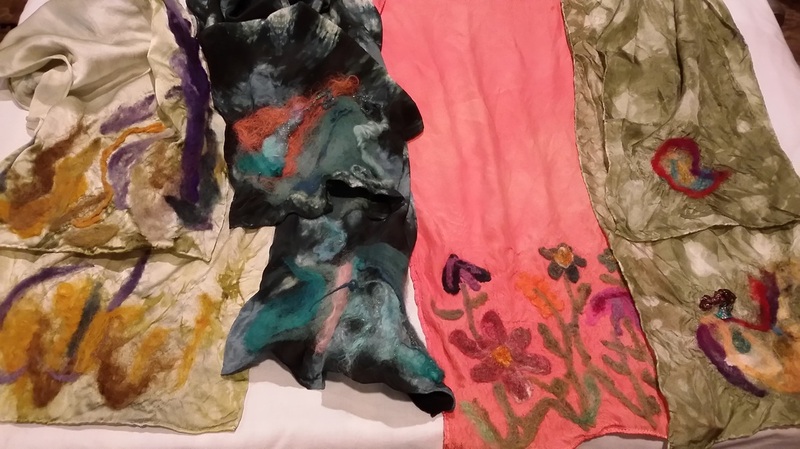 Needle Felting for Adults - Students will select, in class, a pre-dyed silk scarf and roving to use for creating a needle felted design on the scarf. Needle felting techniques will be taught and the student will take home a lovely silk scarf to wear or give as a gift. You will be able to do needle felting at home, on your own, after taking this class! Needlefelted scarves - Scarves dyed and needlefelted using a variety of fibers and yarns. Needle Felting for Children age 7+ - Children will learn how to needle felt by making a felt book mark. Children will choose a shape from those available in class and, using roving, they will needle felt the shape onto the bookmark. Book mark - Felt bookmark with fish shape made by needle felting using a variety of fibers.